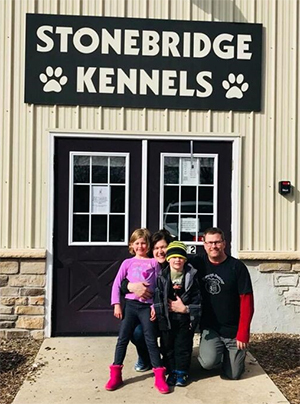 Stonebridge Kennels was founded in 2008 by Catherine and Steve Switzer as a fully licensed dog boarding kennel, doggie daycare, and grooming facility. It is a one stop shop for your dog care needs. They had a vision to incorporate their passion for animals (particularly dogs) with a strong business model on their 6-acre farmstead in Roscoe, IL. It started with an idea, and now, more than a decade since Stonebridge Kennels opened it's doors, the Switzers continue to enhance their vision and benefit the community. See what our customers say below. What led the Switzers to this venture? Both born in the area, Catherine and Steve have been involved with animals and their care since childhood. Catherine volunteered at not-for-profit animal shelters and belonged to the Wildlife Care Clinic at Iowa State University. She graduated from Augustana College in 1995 with a bachelor's degree in Biology and an emphasis in Environmental Studies. After college, Catherine worked for Dean Foods in a managerial capacity and then became a Registered Nurse. She has worked in the medical field, focusing on Emergency Room Nursing, since 2002. Steve grew up outside Belvidere, IL, worked on two farms in the area, and participated in Farm Camp. He graduated from Lawrence University in 1994 with a degree in Biology and an emphasis in Animal Behavior. After successfully owning and operating a landscape company for 8 years, Steve went back to school and became a Registered Nurse. He worked in the Emergency Department. Catherine and Steve met there, got married, and realized they had the same dream. Together, they built a business that involved helping dog owners care for their pets: Stonebridge Kennels. Stonebridge Kennels is located in a country setting, but is less than a mile from downtown Roscoe, IL. It also is easily accessible from major roadways, including I-90, IL Route 251 and IL Route 173. The facility is a classic barn-style building that was built from the ground up to blend in with the semi-rural community. It has 46 spacious masonry kennels, most of which are indoor/outdoor runs. The rest are back-to-back indoor kennels with the option to open a door between them to increase their size. At the end of 2018, Stonebridge announced an expansion project, to add more doggie day care space and a few more kennels. Stonebridge Kennels is a member of theInternational Boarding & Pet Services Association, the local Chamber of Commerce and is licensed by the Illinois Department of Agriculture. They have been involved in several charitable community pet-oriented functions benefiting abused and abandoned animals. These include the Canine Classic and Pet Adopt-A-Thon. Stonebridge Kennels is also a Kibble Korner food donation drop off site. Kibble Korner is a food pantry for Winnebago County pets and their families. Their mission is to keep area pets fed and in the homes they know and love. If you have food to donate, you can bring it to Stonebridge Kennels. Why Stonebridge Kennels for Your Dog? With their strong commitment to animals and the community, you can rest assured your dogs will be well cared for at Stonebridge Kennels. It is your one stop shop for dog boarding, daycare and grooming services. Read our customer reviews below, and visit the other pages on this site to discover what makes Stonebridge Kennels the right choice for you and your beloved pet.